Please join us on Wednesday for our conversation with writer and writing coach Michael Noll. We broadcast Writing on the Air from 6-7pm Central Texas Time every Wednesday on 91.7FM KOOP. You can also stream our show live by clicking on the mini player at the top of the page on KOOP.org. Michael Noll is the editor of the craft-of-writing blog, Read to Write Stories. 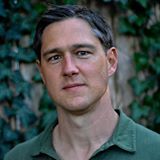 His work has appeared in or forthcoming from American Short Fiction, The Chattahoochee Review, Ellery Queen Mystery Magazine, The Owls, Huffington Post, and The Good Men Project. He served as the writer in residence at the Katherine Anne Porter House and currently lives in Austin with his wife and two kids. He teaches writing at Texas State University and independent workshops in Austin. Michael Noll will be teaching a course for The Writer’s League of Texas on January 31: How to Write a Scene. Find out more about Michael by reading his blog: ReadToWriteStories.com.